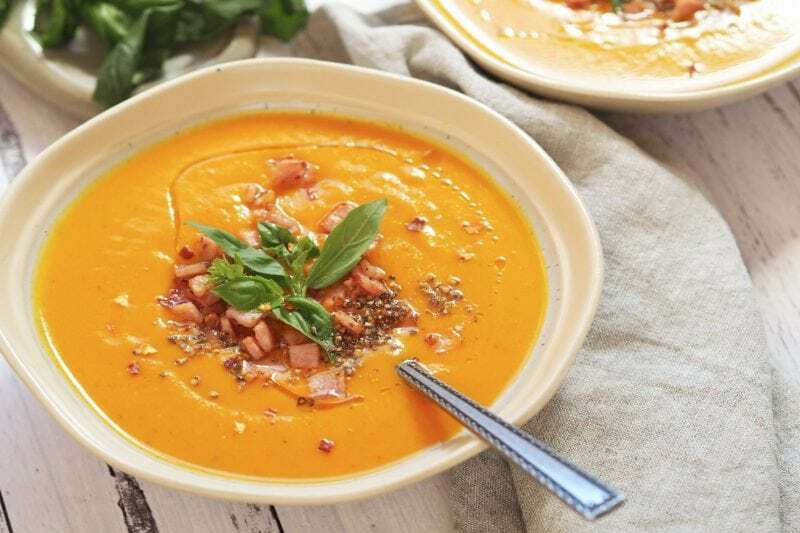 Soup is most definitely a staple in our houses, it’s so nourishing and portable as well, we often take a thermos full to the dance eisteddfod, the netball or even the footy. This has got chicken bone broth powder in it, which we absolutely love and which is so good for our gut health. Related Product: Chicken Bone Broth (Check out our great range of Chicken Bone Broth flavours at our store). We would absolutely love you to leave us a comment below and let everyone know what you think. It’s comments like this that make our day and help us improve a recipe if we need to. We look forward to reading what you think! Cut up pumpkin, sweet potato and onion into large chunks and place on baking tray with garlic cloves and drizzle over olive oil. Lay rashers of bacon over the top of the vegetables in the baking tray and roast for 15 minutes. Remove from oven and place vegetables in thermie jug and break up crispy bacon into bits and set aside. Add chicken bone broth powder and water to under the max line or chicken stock to thermie jug and cook for 15 mins/100ºC/speed 1 until vegetables are soft or mashed up. Blitz soup for 1 min/speed 7 or until smooth. Remove from oven and place vegetables in pot and break up crispy bacon into bits and set aside. Add chicken bone broth powder and water to cover the vegetables or chicken stock to pot and cook simmer for 10 minutes until vegetables are soft or mashed up. Blitz soup with hand blender until smooth.